Hi again, readers of NSBlog! This is my first guest post of 2012, and also my first one writing the introduction myself. I plan to do posts every two weeks, alternating with Mike's to bring back the once-a-week format. This week, at my own suggestion, I'm doing a historical piece on the original programming environment for Macs: The Mac Toolbox. Time for a trip down memory lane! Back In My Day, We Tracked Mouse Drags 512 Pixels Through One-Bit Color! What you had was an 8 Mhz Motorola 68000 CPU, 128KB of RAM (that's kilobytes, as in half the size of the raw rendered HTML for this article!) a 512x384 black & white screen, one 400K 3.5" floppy disk drive, a keyboard with no arrow keys connected with a RJ11 (telephone) plug, a one-button mouse plugged into a DB-9 connector, and if you had paid the extra money or had one left over from your Apple ][, a rather noisy dot-matrix printer with a proprietary DE-9 connector. The machine was not upgradable in any meaningful fashion. While many of these limitations, ridiculous to the point of absurdity by modern standards, were eventually lifted, its legacy carried forward in one very visible way right up until the introduction of the Carbon API with the development Mac OS X: The Mac Toolbox, the original API for programming with the Macintosh computer. The Mac Toolbox was a comprehensive set of APIs for interacting with the Macintosh hardware and operating system to read input, process data, and output results (the fundamental nature of any program). 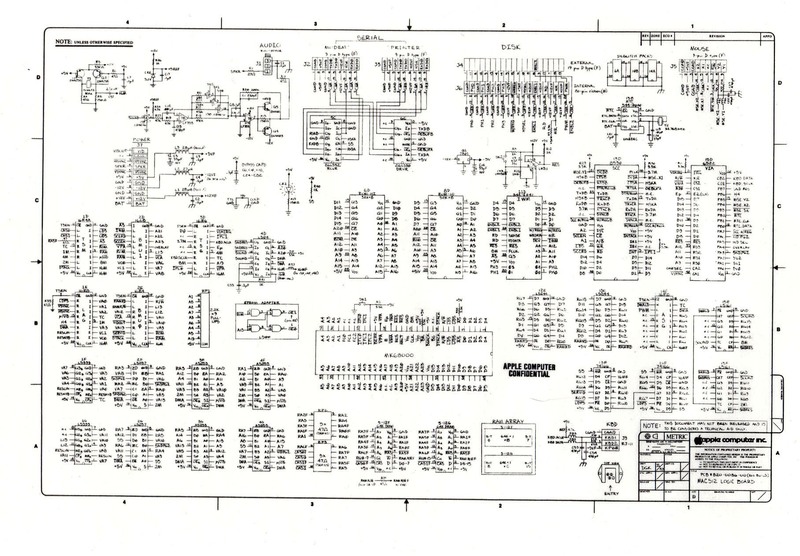 It was originally written in a mix of MC68000 assembly language and Lisa Pascal. To those used to today's Objective-C programming in Cocoa, it can look like quite a lot of gibberish. In particular, even in its most modern incarnation before Carbon, the Toolbox did not do things that many Cocoa programmers have never even considered handling manually. To create an application which has a single window, containing a simple text field with a scroll bar, and functional File and Edit commands is the work of almost zero code in modern Cocoa. The equivelant program using the Mac Toolbox is a bit more complicated. That's three MENU resources for the Apple, File, and Edit menus, an MBAR resource listing the three menus and their resource IDs, and a WIND resource with the basic template for the window. There's also an ALRT/DITL pair for the about box. Now for some code. Please be aware that to keep things from getitng wildly out of hand with complications, I've ignored error checking. This is a Bad Idea at the best of times; with the Toolbox it could often be all but suicidal. It's "okay" for sample code, but you'd never try it in reality. No, I mean it. In Cocoa you can often get away with ignoring errors, though you shouldn't. Back in Toolbox days, you couldn't get away with it. Period. As you can see, I've left a lot of the "meat", the routines that actually do anything, unimplemented. There's two reasons for that: First, it shows just how much raw boilerplate code one had to write in Toolbox-land; a lot of this was unnecessary even with Carbon. In Cocoa only a few lines of it translate to anything other than empty space. The other reason is I just don't remember enough Toolbox anymore to show the implementation of those routines! There are at least three "major" flavors of Classic code: The old System 6 routines, the newer System 7 routines, and the "appearance-aware" routines that came with OS 8.5. Keeping track of which functions belong to which era is problematic enough without realizing that with the amount of manual lifting that has to be done, the 5-line Cocoa app becomes a 2000-line Classic program. All in all, I feel I have to apologize for the terseness of this article. I'd hoped to explore the Toolbox in more depth, but I don't have the time to invest in re-learning a system that, in all likelihood, I will never use again. The Toolbox was a brilliant API for its time, and its worst fault was that it suffered from what all good things do: Age. The Toolbox is gone, but not forgotten. Classic Mac OS, I salute you. Thanks for reading, everyone; I'll be making a followup post in the next few days looking at the code in detail, and I'll be back in two weeks with another Friday Q&A. Stay tuned for Mike's article next week! So... who is the guest blogger? As far as I can see, there's no attribution other than "This is my first guest post of 2012, and also my first one writing the introduction myself." So, not-Mike, thanks for a trip back through history. We'd love to know who you are. Apologies to both readers and author, I forgot to add the byline when I uploaded it. It's fixed now. It is indeed Gwynne. Pedantic Moment: I may be wrong, but I'm pretty sure that it's a 4P4C, non-registered jack on the original Mac keyboard and not an RJ-11. Ian: Completely possible! My information on that particular model comes from Wikipedia and nothing else; I never personally owned a Mac older than the SE/30. For that matter, I've only ever seen an actual Mac 128K once :). It's not what you'd call a common find these days. Other small nit: the B&W displays were 512x342. 512x384 was for the lowest-resolution Mac color displays that Apple ever sold (e.g. the 12" display that matched the LC's width, or the Color Classic). The event handling code look quite similar to how it's done in low-level X Windows. As a kid I loved digging into the innards of applications using ResEdit (even after warnings from my older brother that doing so would most certainly break something). When I finally got into programming, I only got as far as simple REALBasic apps. It wasn't until '04 or so that I learned C, and by then it was all Objective-C. Ever since, I've been curious about that mysterious Toolbox I've heard so much about. Not curious enough to get a book and actually *learn* it, obviously and unfortunately... So I was very happy to read this intro, thank you! I'm really really looking forward to further posts on the topic! Joachim: You'll find the classic Inside Macintosh books and much besides in the legacy documentation portion of Apple's developer site: https://developer.apple.com/legacy/mac/library/navigation/. One legacy doc worth skimming is TN1122 "Locking and Unlocking Handles" (https://developer.apple.com/legacy/mac/library/#technotes/tn/tn1122.html). It was years before Apple realized you could readily mess up the state of something that's either locked or unlocked without a count: your callstack nests, but your lock/unlocks don't, so you have to take care to save and restore that state manually. You'll likely run across code making this same mistake but with a different (more modern) resource at some point. Gwynne, Mike, nice article, thank you! Just a short correction: IdleControls() is a fairly new call. There were no pre-made "edit text" controls until the Appearance Manager, only dialog items (which weren't all controls). Giving idle time to pushbuttons and scroll bars wasn't necessary at that time. 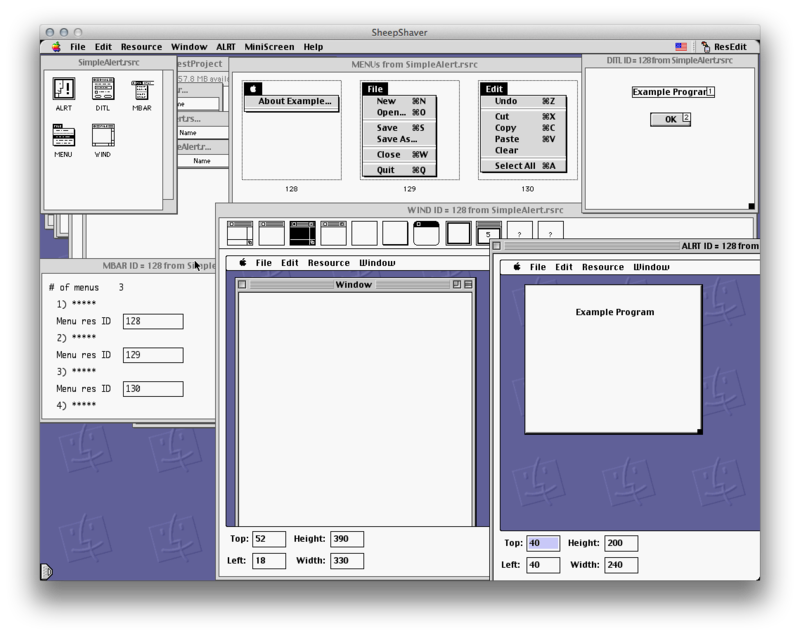 Apart from that, it is a nice example of a System 7-style application. Also, I would at least add a stub function for the update event between the BeginUpdate()/EndUpdate() calls, or a call to DrawControls or somesuch. Uli: It's not for compatibility per se, but rather it's purely a matter of I never did know for certain which things were and weren't part of any given system version :). I was still putting in diskEvt and inSysWindow stuff right up until Carbon Events came along. Of course, even waaay back in the day, sensible programmers didn't use this kind of procedural boilerplate, but wrote an object wrapper around it. I started with Object Pascal, then THINK Class Library (TCL), the first version wasn't even C++ but some weird C thing with some proprietary object extensions - but there was MacApp, later CodeWarrior (C++) and even my own (dare I mention it!) MacZoop (C++). These would be much more familiar to a Cocoa programmer today than raw toolbox stuff.